Quantum theory predicts that a vast number of atoms can be entangled and intertwined by a very strong quantum relationship, even in a macroscopic structure. Until now, however, experimental evidence has been mostly lacking, although recent advances have shown the entanglement of 2,900 atoms. 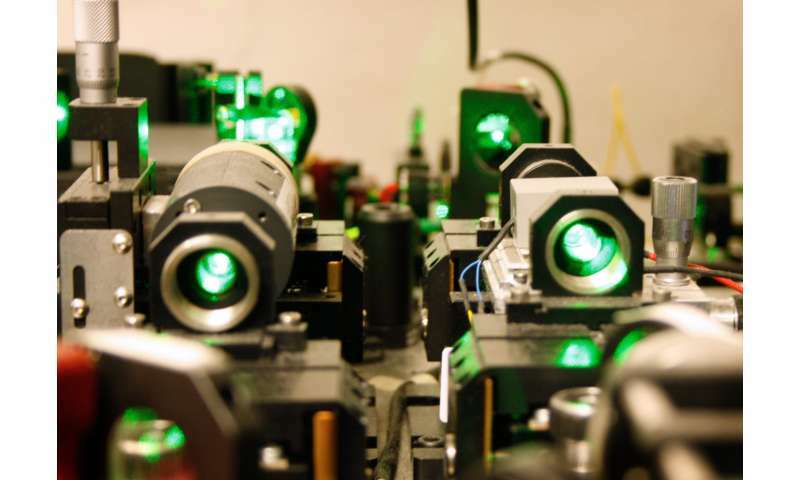 Scientists at the University of Geneva (UNIGE), Switzerland, recently reengineered their data processing, demonstrating that 16 million atoms were entangled in a one-centimetre crystal. They have published their results in Nature Communications. The laws of quantum physics allow immediately detecting when emitted signals are intercepted by a third party. This property is crucial for data protection, especially in the encryption industry, which can now guarantee that customers will be aware of any interception of their messages. These signals also need to be able to travel long distances using special relay devices known as quantum repeaters—crystals enriched with rare earth atoms and cooled to 270 degrees below zero (barely three degrees above absolute zero), whose atoms are entangled and unified by a very strong quantum relationship. When a photon penetrates this small crystal block, entanglement is created between the billions of atoms it traverses. This is explicitly predicted by the theory, and it is exactly what happens as the crystal re-emits a single photon without reading the information it has received. It is relatively easy to entangle two particles: Splitting a photon, for example, generates two entangled photons that have identical properties and behaviours. Florian Fröwis, a researcher in the applied physics group in UNIGE's science faculty, says, "But it's impossible to directly observe the process of entanglement between several million atoms since the mass of data you need to collect and analyse is so huge." As a result, Fröwis and his colleagues chose a more indirect route, pondering what measurements could be undertaken and which would be the most suitable ones. They examined the characteristics of light re-emitted by the crystal, as well as analysing its statistical properties and the probabilities following two major avenues—that the light is re-emitted in a single direction rather than radiating uniformly from the crystal, and that it is made up of a single photon. In this way, the researchers succeeded in showing the entanglement of 16 million atoms when previous observations had a ceiling of a few thousand. In a parallel work, scientists at University of Calgary, Canada, demonstrated entanglement between many large groups of atoms. "We haven't altered the laws of physics," says Mikael Afzelius, a member of Professor Nicolas Gisin's applied physics group. "What has changed is how we handle the flow of data." Particle entanglement is a prerequisite for the quantum revolution that is on the horizon, which will also affect the volumes of data circulating on future networks, together with the power and operating mode of quantum computers. Everything, in fact, depends on the relationship between two particles at the quantum level—a relationship that is much stronger than the simple correlations proposed by the laws of traditional physics. Although the concept of entanglement can be hard to grasp, it can be illustrated using a pair of socks. Imagine a physicist who always wears two socks of different colours. When you spot a red sock on his right ankle, you also immediately learn that the left sock is not red. There is a correlation, in other words, between the two socks. In quantum physics, an infinitely stronger and more mysterious correlation emerges—entanglement. Now, imagine there are two physicists in their own laboratories, with a great distance separating the two. Each scientist has a a photon. If these two photons are in an entangled state, the physicists will see non-local quantum correlations, which conventional physics is unable to explain. They will find that the polarisation of the photons is always opposite (as with the socks in the above example), and that the photon has no intrinsic polarisation. The polarisation measured for each photon is, therefore, entirely random and fundamentally indeterminate before being measured. This is an unsystematic phenomenon that occurs simultaneously in two locations that are far apart—and this is exactly the mystery of quantum correlations. Heisenberg dedicated himself to renouncement of and the futility of formulating a mental image of quantum processes, and even though 'spin' is often spoken of as if particles really do spin, most lecturers at least make a cursory mention that the particles are not actually spinning. Yet here we are having entanglement described as two different coloured socks, a la Bertlmann. And well into the 21st century millions of secondary school students still learn about the the Bohr atomic model without qualification. Isn't it about time we embrace quantum physics more fully. I'm trying to imagine a 12 year old kid grasping plane waves. I think you have to make allowances for that. Isn't it about time we embrace quantum physics more fully. The problem is that quantum physics doesn't lend itself to analogy. Analogy is the act of basing something complicated on something simpler (and that 'something simpler' must be something which is intuitively understood). But quantum physics is already that 'something simpler'. There's just no analogy for it that we can intuitively grasp. ...which eventually led to the "shut up and calculate"-doctrine....which is as close as we can come to "embracing quantum physics"
Is this an example of an analogy: My home has 3 remotes for the TV. One is from the manufacturer of the TV. The 2nd and 3rd remotes are both provided by the local cable box company. All 3 of the remotes have an ON/OFF button that works the TV ON/OFF state. If I use remote 1 to turn ON a device the other two remotes know that if they are used it would be the same as if the 1st. remote had been used again and the device would turn OFF. It seems about as simple as the socks that researcher wears, and my wife can understand that TV example, so I'd like to know if it is or isn't an example. Thanks. @Bob: Im not sure the TV is a good analogy. The weird part about entanglement is having correlations (or anty correlations) of properties of objects which are not in contact. It's as if i had a red ball and a blue ball, i put them in two boxes where you cannot see them, and i give one to you and i keep the other one. If one of us opens the box, even millions of miles away, not only you find out what color ball you got, you instantly know what color the other person got. The weirdness of quantum mechanics consists of the fact that the color of the balls, while in the boxes, is indeterminate, it's not red or blue, but a superposition of both. Only when one box is opened to look inside does the ball "become" red or blue, and you know what the other person got. And you know what the other person got instantly, so quicker than it would take for some information (i.e. light) to get from the other person to you. Plato, Republic 588A-589B, spoke of Young's Light Experiment in another way. He addresses man's inner ability to reason with the resultant small and large. While the light experiment yields wave and particle. The contemporary perception achieved, yielding an entanglement theory from focusing on the atom of matter rather than the force as Plato focuses upon. Understood long ago of man's connection to the divine.